Happy 2013 to you all! I really hope there has been some resting and relaxing in your small corner of the world and that you have some good plans for 2013… we’ve been sweltering in Melbourne since late December (there are small and large bushfires burning all over the southern parts of Australia, which is very worrying) and yet, in a bizarre repeat of last year’s holiday, I started a colourwork project, Kate Davies’ Ursula. You’d think that holding a strand of yarn in one hand would be enough in this kind of weather but I’m going two-handed- nuts! I’m not sure if I’m trying to evoke my cool, damp memories of Shetland by knitting a Shetland-inspired cardigan with Shetland yarn or what, but something seems to be working, as I’m totally loving both the emerging fabric and the knitting of it… so that’s a good start to the year! 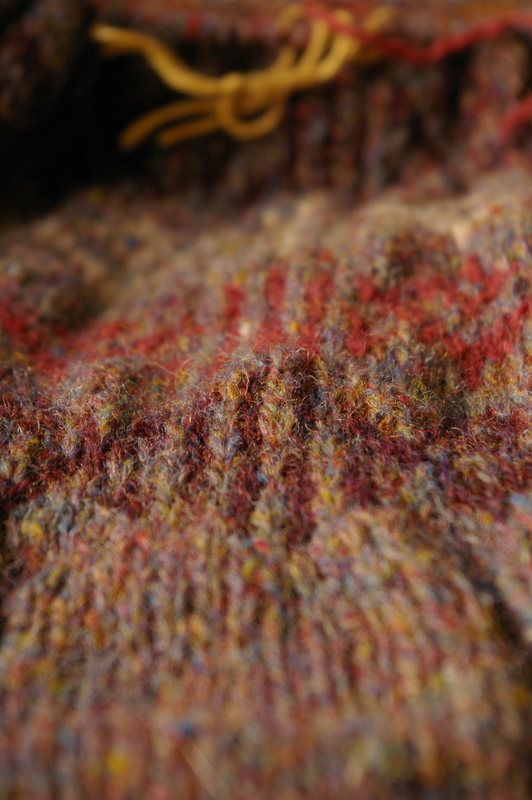 I can’t get the colourwork to lie flat enough to get a clear shot of the design but hopefully you get the idea. I’m super pleased with the colours (Jamieson and Smith 2-ply and Rowan Scottish Tweed), which is a relief as I find it hard to know how colours are going to interact until I’ve knitted quite a large piece! 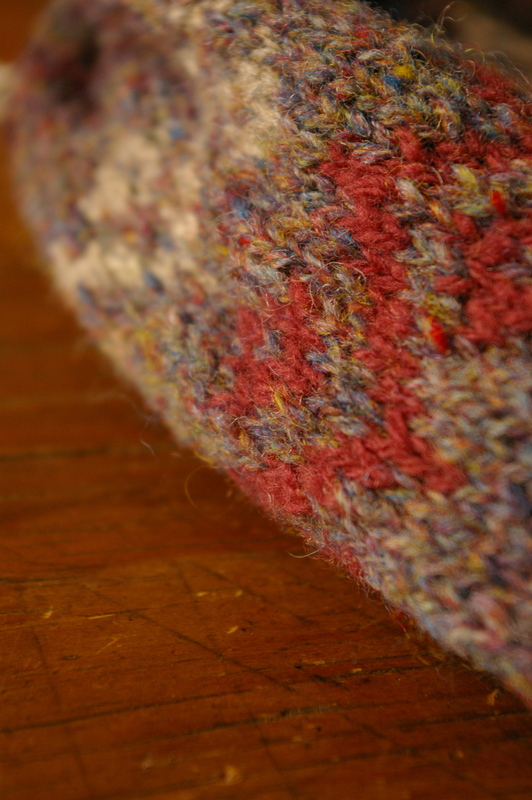 The main colour is Scottish Tweed in Herring, a wild and elusive colour that looks blue-grey but actually has a bit of everything in it. I wasn’t sure how the other colours would work with it but I they seem to pick up and highlight all the different shades in the blend. This’ll be my first full-size, steeked colourwork project and I’m pretty excited! 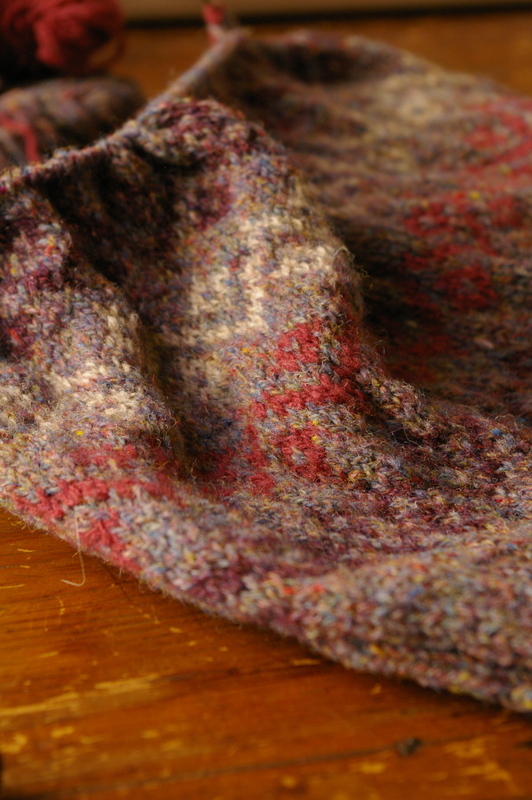 For you non-knitters, steeking involves knitting a garment as a tube and, at the same time, inserting columns of extra stitches where you want the armholes and front opening to be and later cutting up those columns to enable you to work the openings. This is done because knitting colourwork is much quicker and easier in the round! 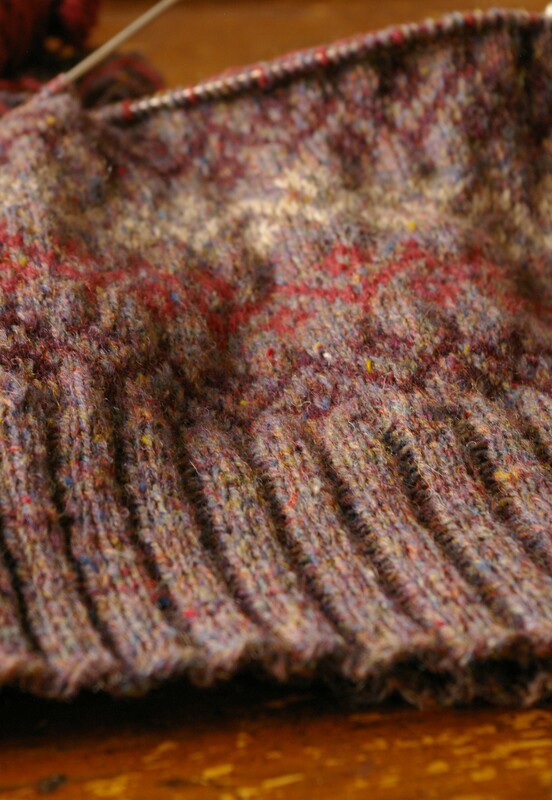 Below, you can see the columns of stitches that form the steek. It’s been a while since I felt this excited about knitting and what I was making- I feel like I’m learning to knit all over again! I want to keep pushing myself to try to learn new things, so I have to thank Kate for providing that inspiration- as always, she’s produced a beautiful, well-written design with lots to keep me engaged and some solid techniques to learn. I’m converting the design to a v-neck as I always wear cardigans unbuttoned and I think it’ll hang better that way. As always, I’m finding myself being extra-cautious about not working the colourwork too tightly and so my tension is a bit looser than it should be! I think the end product will be a bit bigger than planned but that kind of suits me- I’d be quite happy if my cardigan was slightly grandpa-ish, rather than fitted (shh, don’t tell Kate!) and I may add pockets later if that is the case. A friend told me that the colours reminded him of James Herriot (a great compliment given that he, along with David Attenborough, was my biggest childhood crush!) and I guess I’m hoping that the finished cardigan will fit in in the city but hint at its island roots! 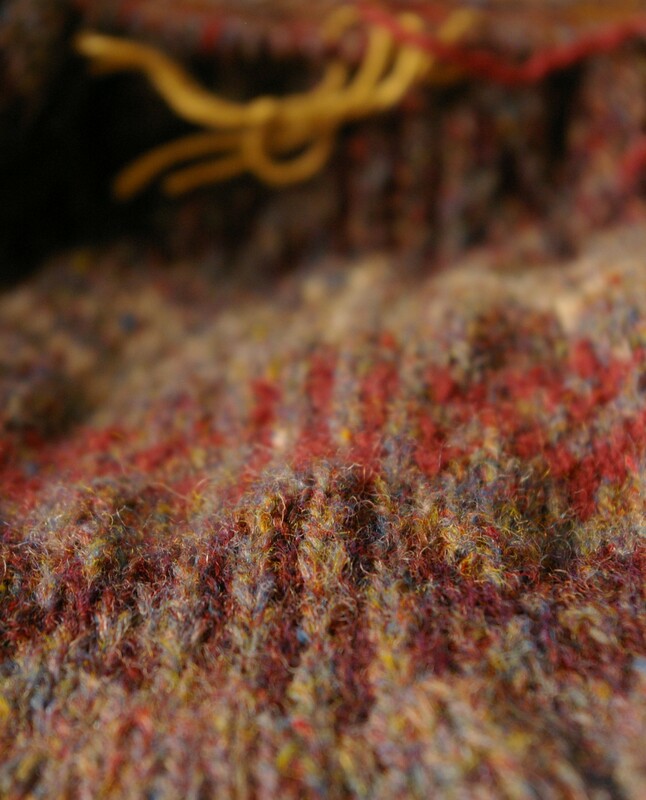 What’s your first knitting/ sewing/ writing/ planting/ creative project for the year?! This entry was posted in knitting and yarn and tagged kate davies, ursula cardigan on January 8, 2013 by admin. It is beautiful Jules, I think I need to do more colourwork and maybe even try steeking too. Oh my, this is soooo gorgeous! 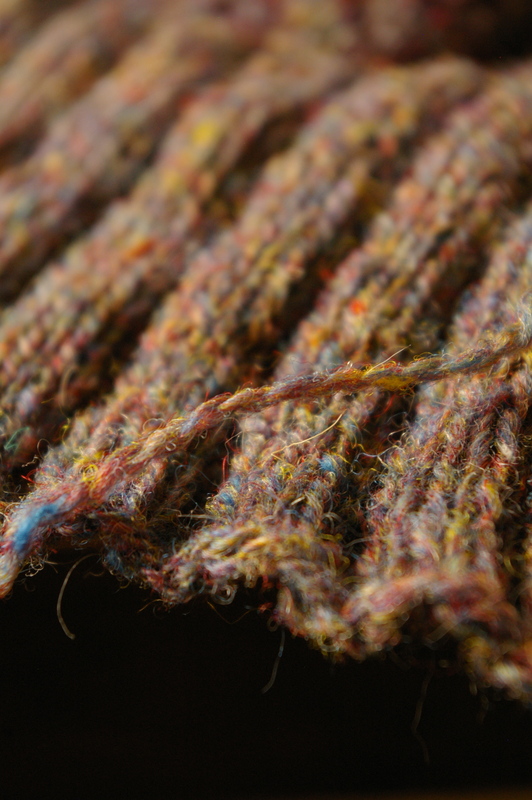 I knit a shawl in that Herring Scottish Tweed, and it is elusive! I love yarns that are like that. So much depth. I can’t wait to see the finished product. I loved the original cardigan colour-scheme, but I love yours even more! I love that cardigan!! Gorgeous! I think I like your color choices better than Kate’s! Your Ursula is beautiful. Converting it to a v-neck is such a good idea, I can’t wait to see how it turns out. I’ve cheated a little (not that there are any rules) and started my first creative project on Christmas Day. It’s a wolf face that I’m cross stitching onto a canvas bag. It’s not a difficult project but it’s so nice to see the design being coloured in, little by little. I want to make this also, I feel in love with it as soon as I saw it. Unfortunately for me, I have a few other ahem… ahem projects to take care of first. I can’t wait to see yours! Jules, it looks absolutely divine! I can’t wait to see it in person and squish it! It’s beautiful, and the Real Deal for sure ! I look forward to the post of you wearing it !